Cast: Sakurai Sho, Oshima Yuko, Miyazawa Rie and Nakamura Aoi. This is the first out of 3 stories about the school system changing in Japan. 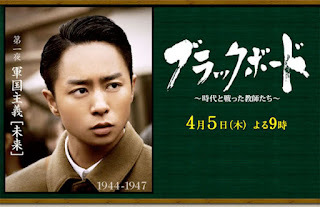 In 1944 Shirahama Shohei (Sakurai Sho) proudly announced to his class that he would be going to war fighting the Americans in the Second World War. Encouraging his students to do the same after they graduate, he leaves filled with honor and pride, fighting what he calls the ‘Holywar’. Hmm, as I said before, I like school dramas, and I like Arashi, but somehow this didn’t go that far for me. It is very interesting, from a history point of view, but I didn’t really feel the ‘school’ in this. I liked Sho’s performance, and I enjoyed the special, I did honestly. But it was not what I had expected, and it didn’t really “fill” me, meaning I didn’t feel I got enough. I can’t really say much, except that it has heart, and it shows a teacher growing with his pain and changing his life. I would recommend if you like history and if you like Sakurai Sho.